I cannot thank you enough for all of the kind comments and emails I received on yesterday’s post. I don’t normally share that much of my personal life with you. So to those of you who shared stories of your furry friends – thank you. It is truly comforting to know that many of you understand the unconditional love of a pet. Now as promised, back to the sweet stuff. Today’s Real Party stood out to me because you can see the love and the joy in this celebration. It was more about celebrating with family than about staging a huge bash. Sometimes I think we can get caught up in all of the party details – the perfectly symmetrical dessert table and the over-the-top cakes. Sometimes it’s nice to step back and remember why we’re celebrating in the first place. This charming first birthday party, hosted by Melody of Innove Events, takes us back to the days when birthdays were about cake, ice cream and family. I love that Melody kept the party small and therefore was able to hire a photographer to capture the day. By now, the cake and ice cream are gone but they will forever have these gorgeous photographs. And really, this party was still incredibly adorable. Simple yet perfectly styled and just down right charming. I would expect nothing less from Melody! You should also check out her amazing Princess & Pirates Party that we featured last May. 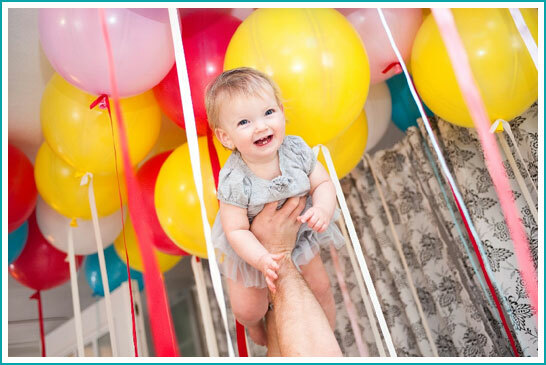 A very special thank you to Melody for sharing this lovely first birthday party with us. Wishing Reese many more beautiful birthdays to come! So adorable!! Love all of the balloons! Love it!! Love the concept too! very fun retro vibe to this party! Love, love the concept, looks like tons of fun, nothing more important then having the family together. Love the overall colors! very colorful…:) The whole things look so great! And very true about having the family together. Nothing is more important than that! ADORABLE! I love everything about this! 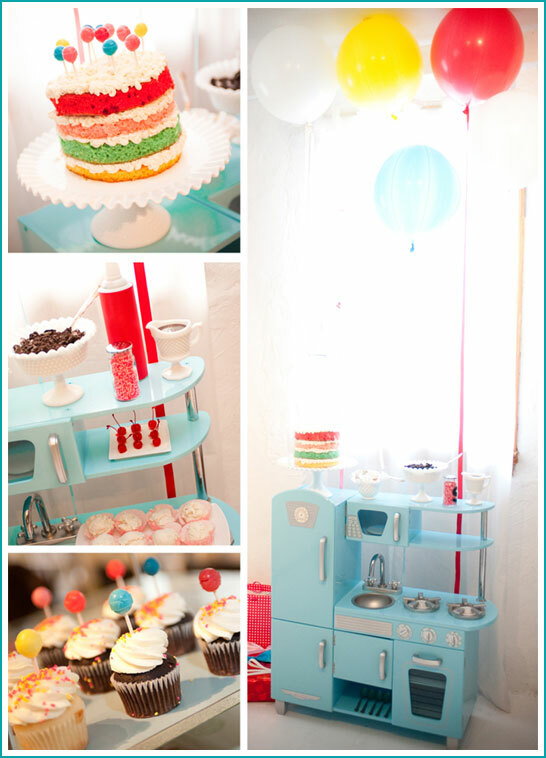 the kitchen, the colors, the balloons… OH MY!!!! Hey, will you please tell me wher you found those big balloons!! I love them! Everything is so pretty. I like doing the balloons on the ceiling like that. Quick and very effective! Cutest party pictures I have ever seen!! Love it all.